Artist depiction of what the Tower of Babel (temple of Enki at Eridu) would have looked like if it had been finished. Archaeologists who excavated the E-abzu in the late 1940s discovered “the total abandonment of the site” before its completion–just as described in Genesis 11:8-9. They mean well, but Christians celebrating the newly translated tablet from ancient Babylon are mistaken. Contrary to the report by the Smithsonian Channel, the tablet is not evidence of the existence of the Tower of Babel. The tablet dates to the 6th century B.C. The inscription describes a building project by king Nebuchadnezzar, who was known for big public works projects. But the Tower of Babel was not one of them. Does this mean there is no physical evidence for the existence of the Tower of Babel? No! There is plenty of evidence and secular scholars know it. But Nebuchadnezzar is the wrong king in the wrong place at the wrong time for his ziggurat to be Babel. First of all, nobody thinks Nebuchadnezzar was Nimrod. Assuming Nimrod ruled during the Uruk Expansion period, which covered most of the 4th millennium B.C. (4000 B.C.-3000 B.C. ), then Nebuchadnezzar is about 3,000 years too late to be the builder of Babel. In fact, Babylon wasn’t even founded until about 2300 B.C. The kingdom of Babylon was founded by an Amorite chief named Sumu-Abum in 1894 B.C. 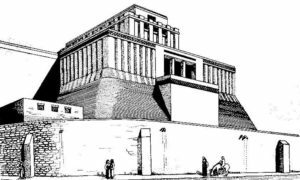 Second, the oldest, largest, and arguably most important ziggurat in Mesopotamian history was the temple of Enki/Ea, the Sumerian/Akkadian “lord of the earth,” the god of wisdom, magic, and exorcism. It was located at Eridu, about 150 miles southeast of Babylon. The e-abzu (“House of the Abyss”) was so important in Mesopotamian religion that as late as Nebuchadnezzar’s time, kings of Babylon sometimes referred to themselves as LUGAL.NUNki–king of Eridu. For more on why Babel was not at Babylon, read this free excerpt from my new book, The Great Inception: Satan’s PSYOPs from Eden to Armageddon.